This new title, written by two fundraising professionals with track records of success in development offices large and small— in universities, religious and performing arts schools, public media and community organizations— zooms in on the all important one-to-one conversations with your prospects and donors to help you make the connections that result in new and increasing contributions for your organization. 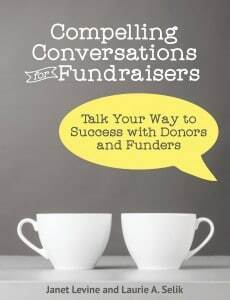 Whether you are new to fundraising or a seasoned pro, in a one-person development office or a large university advancement department, Compelling Conversations for Fundraisers provides conversation guidance and helpful tips for the many types of donor interactions you will face and reviews the essentials for meeting prospects and talking your way to success. Buy Compelling Conversations for Fundraisers! Check Out All Our Books!